This is the second milestone post of the weekend for me. 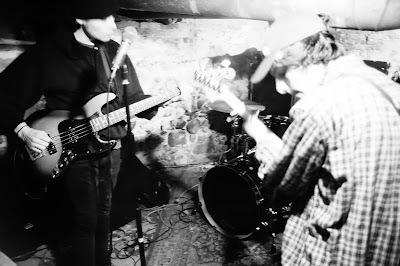 It gives me great pleasure to be able to bring you a stream of new song Glacial by Massachusetts punk trio Sleeper Wave. It is one of four tracks that the band are contributing to a special double LP release called "Eight Feet Under Vol.1", which features eight bands from four countries and twenty two songs! The record itself comes on two black LPs, in a gatefold sleeve with artwork courtesy of Italian graffiti artist Nero. It will be released on June 1st. There are five labels involved in it's release and they are Zegema Beach Records, Shove Records, Through Love Records, IFB Records & Don't Live Like Me Records. It's truly a multi-national release with two Swedish bands (Vi Som Alskade Varandra Sa Mycket & Via Fondo), two Canadian bands (Nous Etions & The World That Summer), two US bands (Sleeper Wave & Youth Novel) and two Italian bands (Lamantide & Pastel) all appearing.